We can help you solve the puzzle! 0 Life Changes. Protect it. 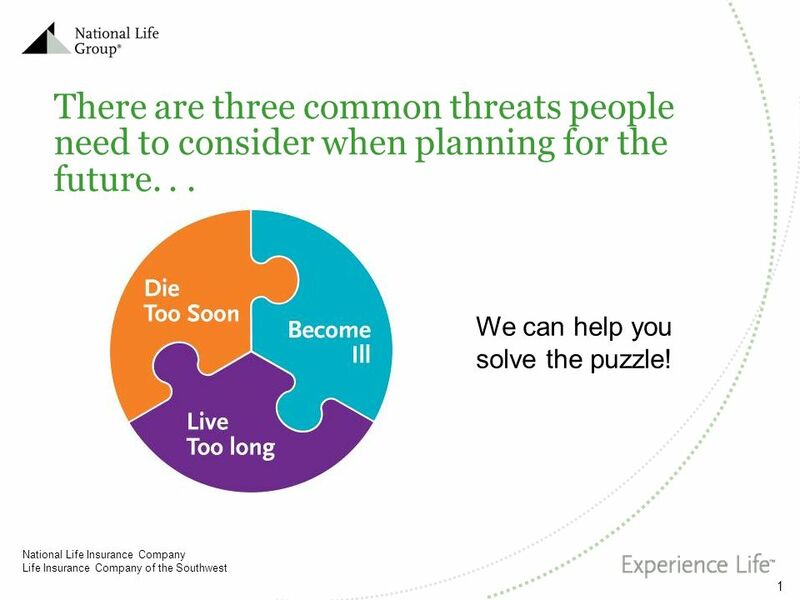 1 There are three common threats people need to consider when planning for the future. . .
We can help you solve the puzzle! 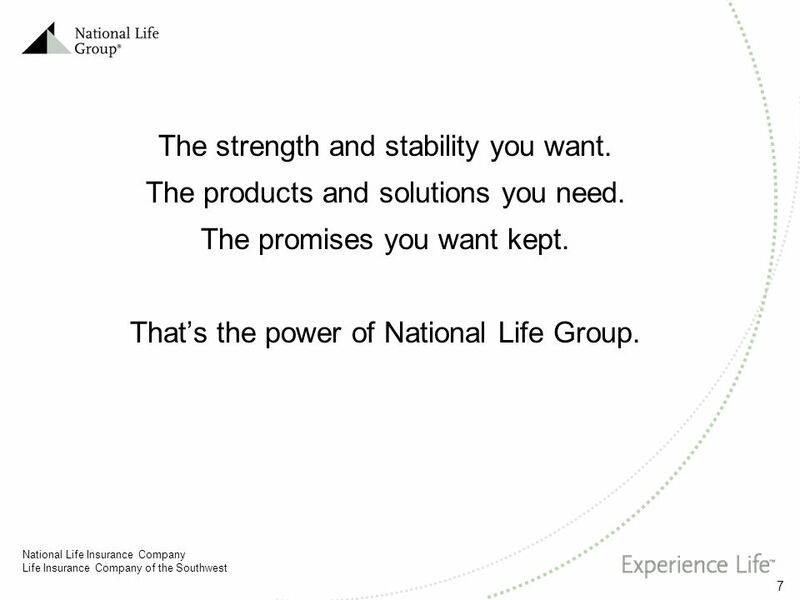 Through National Life Group’s manufacturing companies, you have access to the products you might need for whatever life brings. From simply making sure your family or business is financially secure in the event of your death, to helping you plan for retirement, in case you’re diagnosed with a terminal, critical or chronic illness, or just want to accumulate income for college funding or taking that trip you’ve always wanted. 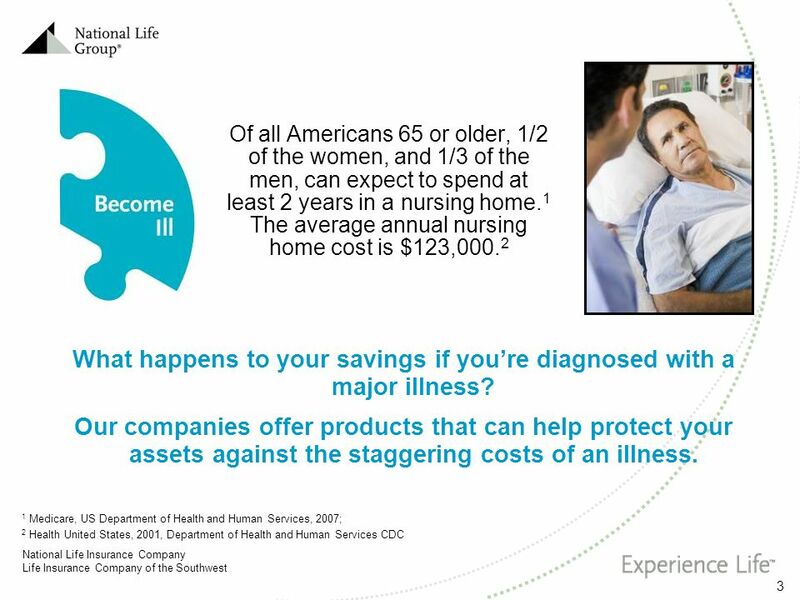 3 What happens to your savings if you’re diagnosed with a major illness? 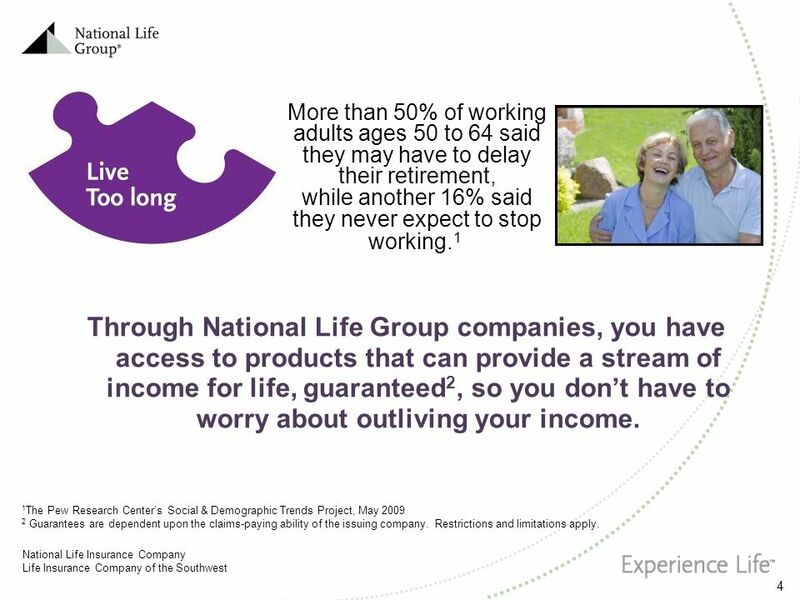 4 More than 50% of working adults ages 50 to 64 said they may have to delay their retirement, while another 16% said they never expect to stop working.1 Through National Life Group companies, you have access to products that can provide a stream of income for life, guaranteed2, so you don’t have to worry about outliving your income. The fear of outliving retirement savings is a very realistic concern to many who face retirement and for good reason. Growing old in America is not what it used to be, and in many ways, that’s a good thing. People are not only living longer, they have better educations – resulting in better health, higher income, and a higher standard of living in retirement. But there is a flip side to the coin, as Americans continue to live longer a new challenge presents itself: “What if I run out of retirement savings?” What would be your options? Go back to work? At what age? Chances are, at a later retirement age, working may be to physically demanding. And even if you are physically capable of working, is that really how you want to spend your final years in retirement? Fortunately, you have another option: Our insurance products offer features that can provide a stream of income for life, guaranteed. 1The Pew Research Center’s Social & Demographic Trends Project, May 2009 2 Guarantees are dependent upon the claims-paying ability of the issuing company. Restrictions and limitations apply. 5 Life Changes. Protect It. 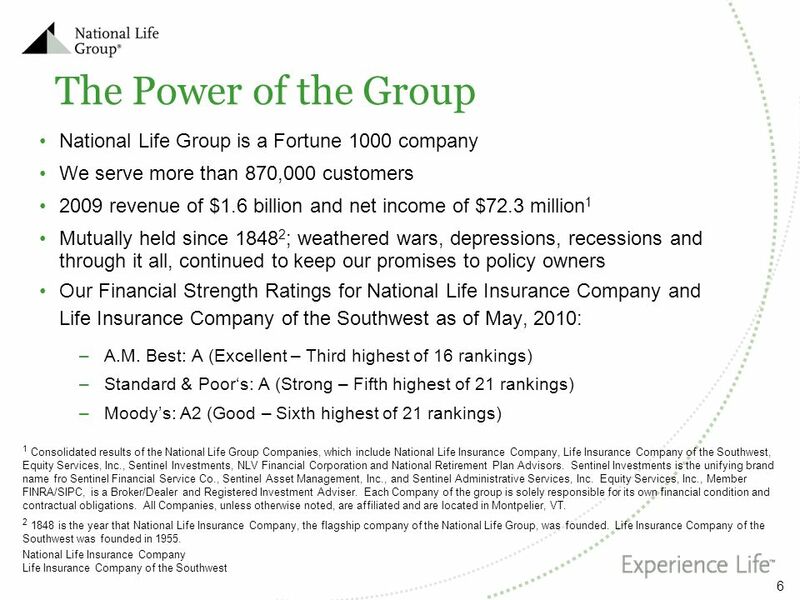 We serve more than 870,000 customers 2009 revenue of $1.6 billion and net income of $72.3 million1 Mutually held since 18482; weathered wars, depressions, recessions and through it all, continued to keep our promises to policy owners Our Financial Strength Ratings for National Life Insurance Company and Life Insurance Company of the Southwest as of May, 2010: A.M. Best: A (Excellent – Third highest of 16 rankings) Standard & Poor‘s: A (Strong – Fifth highest of 21 rankings) Moody’s: A2 (Good – Sixth highest of 21 rankings) 1 Consolidated results of the National Life Group Companies, which include National Life Insurance Company, Life Insurance Company of the Southwest, Equity Services, Inc., Sentinel Investments, NLV Financial Corporation and National Retirement Plan Advisors. Sentinel Investments is the unifying brand name fro Sentinel Financial Service Co., Sentinel Asset Management, Inc., and Sentinel Administrative Services, Inc. Equity Services, Inc., Member FINRA/SIPC, is a Broker/Dealer and Registered Investment Adviser. Each Company of the group is solely responsible for its own financial condition and contractual obligations. 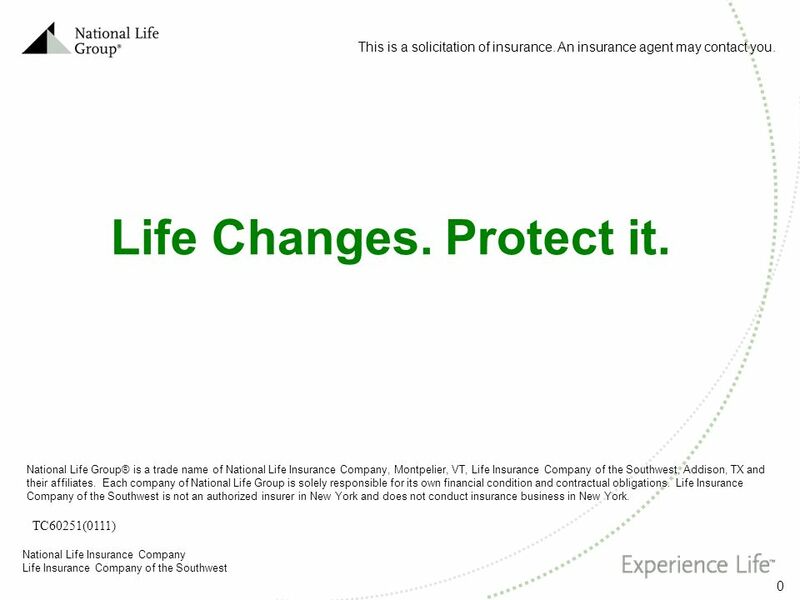 All Companies, unless otherwise noted, are affiliated and are located in Montpelier, VT. is the year that National Life Insurance Company, the flagship company of the National Life Group, was founded. 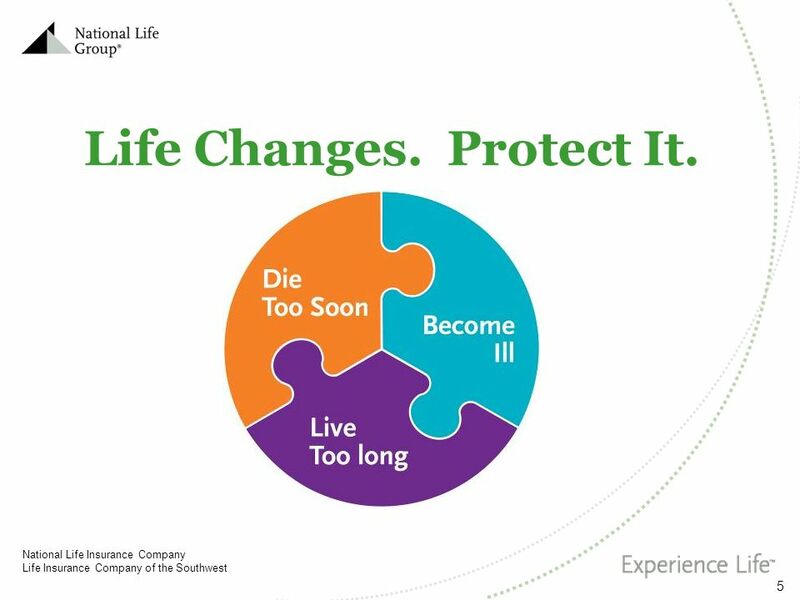 Life Insurance Company of the Southwest was founded in 1955. 7 The strength and stability you want. The products and solutions you need. The promises you want kept. That’s the power of National Life Group. Download ppt "We can help you solve the puzzle!" 1 Retirement in America Innovation, Research & Analytics February 25, 2010 A Survey of Financial Concerns and Expectations of Consumers and Economists. 0 Important Notice The following presentation has been developed and approved for use by authorized producers and agents of the insurers of American General. 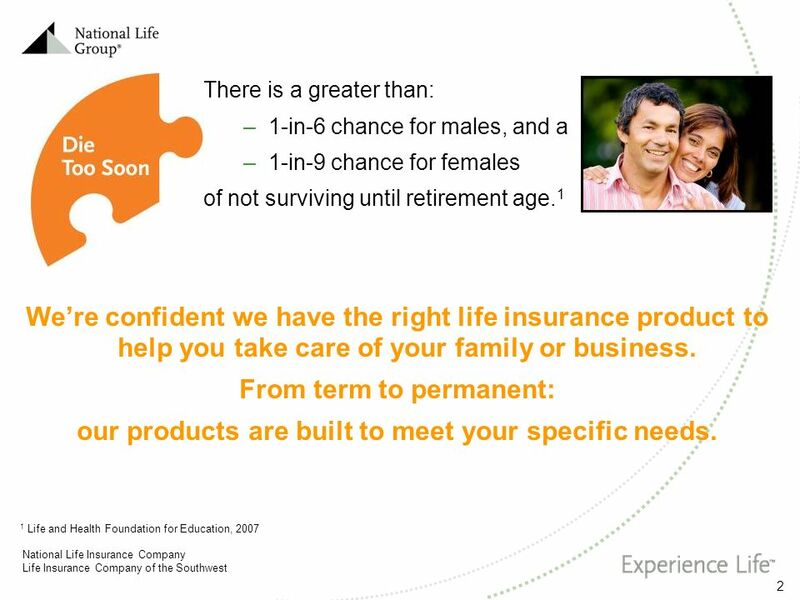 Life Insurance You Don’t Have to Die to Use. Take Charge and Reach Your Goals. Insurance The PICPA The Pennsylvania Institute of Certified Public Accountants The PICPA is a professional association. John Amson Capitman, PhD. Nickerson Professor of Health Policy Central Valley Health Policy Institute California State University, Fresno. Critical Illness Presentation Pack Within this pack you will find a number of slides that you can select from to build your own CI presentation that suits. The Impact of the Recession on Women in the United States Presented by Lynn Gardner Heffron September 29, 2011. 1 GROUP LONG-TERM CARE ARCHDIOCESE of MINNEAPOLIS and ST. PAUL INFORMATION MEETING November 2008. What Is Long Term Care?. u Long Term Care is an ever changing array of services aimed at helping people with chronic conditions cope with limitations. ©2008 Lincoln National Corporation For agent or broker use only. Not to be used with the general public. LCN /08. [Name] [Title] Lincoln. Important Note The following presentation has been developed and approved for use by authorized producers and agents of the insurers of American General.